Story: Betsy is the ever-present secretary at the BVD. Like Willemse she has to put up with Hendrik IJzerbroot's strange arrivals at the office. On occasions she also has field assignments as an agent. Background notes: Like James Bond, Agent 327 also needs a secretary with a crush on him. 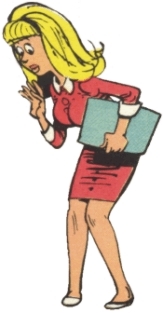 Betsy does however interact more with the characters in the series than Miss Moneypenny in the James Bond movies. Miss Moneypenny: Another secretary dealing with secret agents. From Ian Fleming's James Bond.